A new overstock custom laser optics parts list featuring several hundred different configurations of optics available for overnight delivery is being introduced by Laser Research Optics of Providence, Rhode Island. 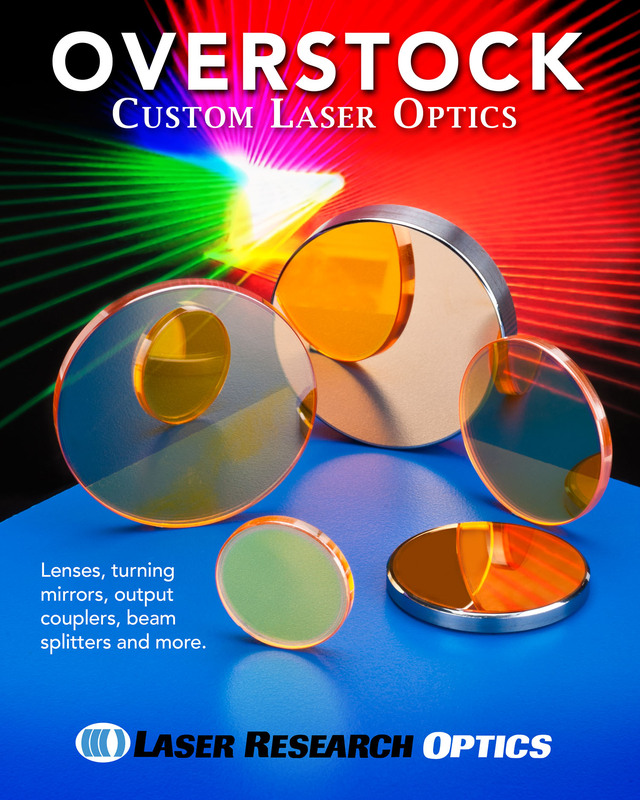 The Laser Research Overstock Custom Laser Optics list includes over 400 types of lenses, turning mirrors, output couplers, beam splitters, beam combiners and more that are first-quality optics resulting from production overruns. Materials include ZnSe, fused silica, copper, silicon, and germanium in 0.5” to 2.0” O.D. and 15 mm to 50 mm O.D. sizes and in odd metric sizes in varying thicknesses; coated and uncoated. Featuring optics for medical lasers, R&D, 9.3 µm, 10.6 µm, and 3 to 12 µm lasers, the Laser Research Overstock Custom Laser Optics list offers laser developers and owners of older lasers including Coherent®, Mazak®, Mitsu-bishi®, Strippit®, and other types with the opportunity to save 30% to 40% off of list prices for optics. Overnight delivery eliminates downtime. The Laser Research Overstock Custom Laser Optics list includes quantities offered and prices; available at www.laserresearchoptics.net.